There's this scene in the old Blues Brothers movie, where Jake and Elwood arrive at their first post-prison gig at Bob's Country Bunker, a country bar. Elwood, after looking around the joint, asks the female owner and bartender, "What kind of music do you usually have here?" She replies, in a perfect twang, "Oh, we got both kinds. We got country and western. In tell that tidbit to tell you this. 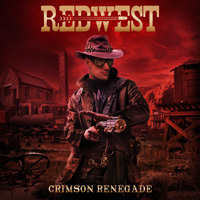 Redwest, from Milan, attempts to combine basic heavy power metal with spaghetti western themes and music. Think Sergio Leone, Ennio Morricone, Clint Eastwood, and Lee Van Cleef wrapped up in Italian power metal. Then drop in a little steam punk motif, and you have Redwest who unapologetically call their music "Spaghetti Western Metal." The thing is other bands have been doing something similar. Desperadoz comes to mind, maybe a little Volbeat. You know what? It's not all that interesting. First, you don't really hear any of the "western' motif until the third song, The Ballad Of Eddie W. Fire is much better from the guitar to the whistling to the rhythm and groove. Alternatively, Bullet Train sounds pretty much like swift heavy metal. A Fistful Of Dollars, if alluding to that iconic Leone/Eastwood movie, misses the spaghetti western theme entirely. Then Golden Sands sounds like Redwest is confusing southwest New Mexico with Irish music, like somebody should be dancing a jib around the campfire while they eat beans of tin plates. Poker is another feels the same way. Anyway. I guess Redwest's spaghetti western metal is supposed to be something of novelty, but it loses it's intrigue rather quickly with the first spin. Check them out, you may think otherwise. I guess Redwest's spaghetti western metal is supposed to be something of novelty, but it loses it's intrigue rather quickly with the first spin. Check them out, you may think otherwise.